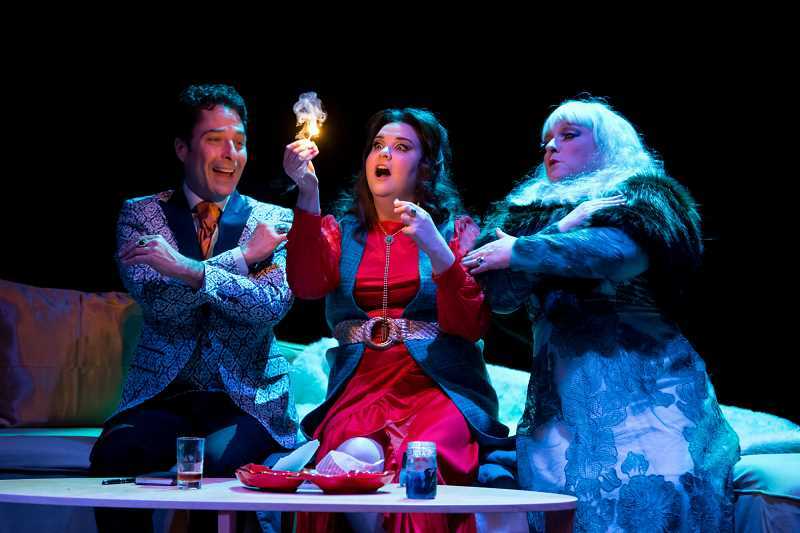 Tina Arth reviews Bag&Baggage's holiday production, 'Bell, Book, and Candle,' taking audiences back to 1950s New York. While I was busily counting my blessings on Thanksgiving, last month, one of the things I was thankful for was the exceptional diversity of this year's holiday-season theatrical offerings. A shining — no, sparkling — example of this is Bag&Baggage's delightful "Bell, Book and Candle," John Van Druten's 1950 play, later made into a classic 1958 movie and part of the inspiration for the TV series "Bewitched." B&B's 2018-19 theme is "Love. Thrill. Magic. Wonder. Change." and director Scott Palmer's production hits every note. Like so much good theater, the show can be enjoyed on several levels. The most superficial take is great fun, a witty comic romp with an eccentric social circle in 1950s Greenwich Village. The tale unfolds as a family of campy, over-the-top witches (Gillian, warlock brother Nick, and Aunt Queenie) encounter two outsiders: one a conventional, mainstream romantic lead (Shep Henderson) and the other an author (Sidney Reditch) who is exploring witch subculture for his next book. Gillian is ferociously attracted to Shep, and originally essays to seduce him without the use of witchcraft, but eventually casts a fast-acting spell. Shep is hooked. Gillian is furious when she learns that Nick has been revealing the secrets of witchcraft to Sidney, and she casts a spell that will prevent his book's publication. Aunt Queenie, having come to witchcraft later in life, has no appropriate peer group and no clue about how to blend in with the regular humans around her. Naturally, things go awry. First, the romantic spell is strong enough that Gillian also succumbs — catastrophic for a witch, since falling in love means that she loses her supernatural powers. Neither Nick nor Aunt Queenie knows how to react to the now human Gillian, and neither is eager to lose a beloved sister/niece to conventional society. In the meantime, Shep storms off when he learns that he was originally ensnared by witchcraft, and tries (but fails) to return to his former fiancé. As in any good rom-com, ultimately he and Gillian reunite and things work out reasonably well for Nick and Queenie. Viewed through a more analytical lens, "Bell, Book and Candle" uses its frothy exterior to deliver a thought-provoking exploration of the dilemmas faced by members of a forbidden subculture faced with the choice of concealing their true selves or being rejected and scorned by the dominant majority. ing two plays for the price of one! While all five cast members give strong performances, the show really belongs to the three witches. Jessi Walters is brilliant as sly, seductive Gillian, her transition to heartbroken human stunning (yes, those are real tears! ), and she wields those huge eyes and fabulous legs like a forties femme fatale. Kymberli Colbourne's "Aunt Queen" is utterly fabulous , with glimpses of Aunt Clara from "Bewitched" but more seductive, less befuddled. Speaking of "Bewitched," there's Norman Wilson as warlock Nick , who brings frequent touches of Paul Lynde's "Uncle Arthur," but with a crisper delivery, boyish enthusiasm, absolute self-confidence and remarkable swagger. He handles the other two men as adroitly as he handles his dashing cape, combining great timing, physical comedy, and an utterly cheerful snarkiness. The magic comes alive through the creativity of the production team, in particular, Jim Ricks-White's lighting and Lawrence Siulagi's projection design. Melissa Heller's sometimes eye-popping costumes could stand alone to define each character. One look at Nick's spectacular plaid suit next to Shep's relatively restrained pin stripes tells us everything we need to know. After the endless barrage of carols, Santa, and elves it's a real treat to settle in for some real holiday magic, and Scott Palmer's Christmas offering is a present you owe yourself. of the ginger cookies at the bar! Bag&Baggage's "Bell, Book and Candle" is playing at The Vault, 350 E. Main St., in Hillsboro, through Dec. 23, with 7:30 p.m. performances Thursday, Friday, and Saturday and 2:00 p.m. Sunday matinees.